Product #46117 | SKU ALBERT | 0.0 (no ratings yet) Thanks for your rating! The Equinox Albert Carbon Fibre Travel Tripod from 3 Legged Thing has five leg sections that can extend to a maximum height of 179 cm and also go as low as 13 cm. At the 23° angle leg spread, which is considered a normal stance, the tripod can support a maximum of 30 kg. (The legs have two additional wider stances, and these will support less weight.) The twist lock's Para-lock feature works by restricting the opening movement of the friction lock, preventing you from accidentally unscrewing the lock until the leg section detaches. 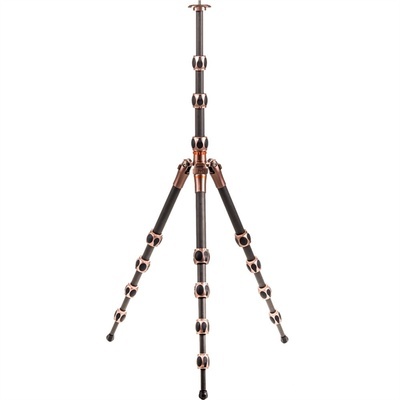 All 3 Legged Thing tripods have a detachable leg with standard 3/8"-16 threads at both ends. The Tri-mount plate and threaded bolt can be unscrewed and removed from the top of the centre column, then screwed directly onto the leg. The detachable leg can be used as a monopod, microphone boom, and selfie stick.